Description: The Chattahoochee Bay local has pulled up on the former CofG mainline from Dothan as the NS local returns from the CIRR yard at Hilton GA. Description: CHAT 2882 shows a lot of hard miles. 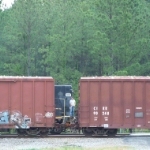 The unit began life on the old Norfolk Southern and has seen many owners since. Description: Todays Chattahoochee Bay local consists of the normal locomotive consist of the GP8 and a GP38. They are leading a cut of cars from the CIRR yard toward the NS yard. Description: The CIRR switch local prepares to head back toward their trackage while the Chattahoochee Bay waits their turn. Description: Inside The Bay Line shop in August of 2007.